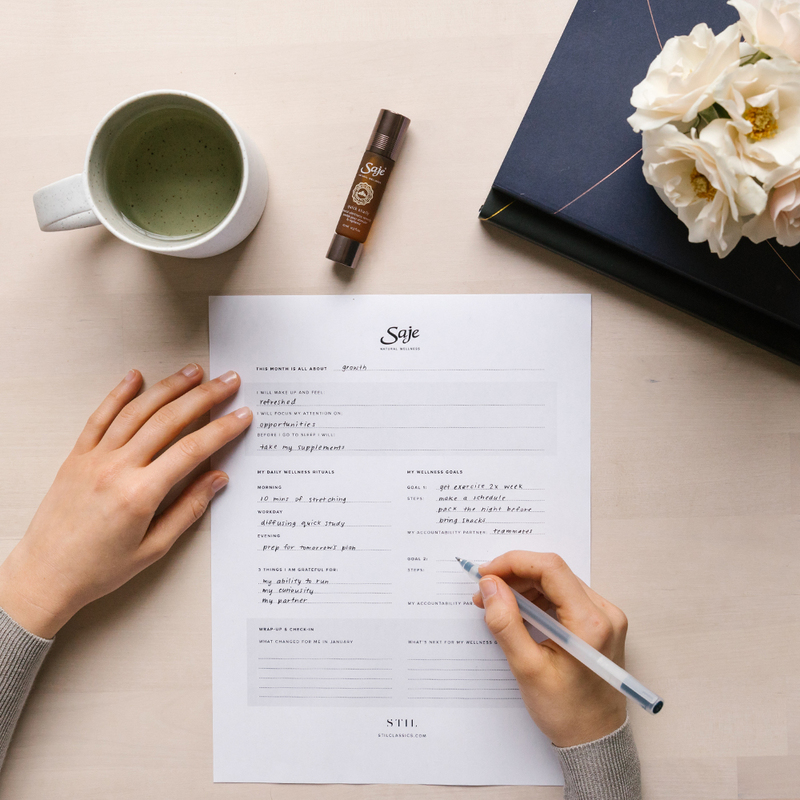 Founder of STIL journal shares a page out of her book to help you stay committed to your wellness intentions this month. January is a perfect time of year to check in with yourself and how you’re feeling. During this time of reflection, we often make New Year’s resolutions, many of which don’t make it through to February. This year, let’s make wellness easy by making small choices every day and setting intentions instead of a goals. To help us make a lasting shift in our lives, we called in a little help from our friend Marissa, Founder of STIL, a brand of beautiful journals designed to help us take charge of our busy days and make room for little moments that are just for us. Inspired by her 365 Journal, we co-created a one-page journal to help guide your wellness for the month of January. Print the page by downloading this PDF, grab a pen, do a Saje Breath and get ready to feel better through the power of intention-setting. Read on for ways to use the journal for our #30daysofwellness. We’re all for setting goals, and we’re also all about not adding pressure or expectations to our wellness practices. When you’re setting an intention, what you’re really doing is choosing how you want to feel. We like to say that when you start with intention, you create conditions for change in your life. Intentions are often described as what gives your days purpose, and the motivation to live the life you want. When you change your thinking from what you’re going to do to how you want to feel, your day-to-day choices can feel easier. It also helps you focus on one thing throughout the course of a day, a week or even a month instead of a long list of tasks that might just leave you feeling stressed. So, how do you want your January to feel? Think of a single word or even a short phrase that describes the state of mind you wish to be in during the month ahead—try to aim for something positive. If your 2018 was crazy-busy and you’re looking for a change, your intention might be ‘calmness’, or ‘restoration’, or ‘doing less’, as opposed to ‘not being so busy’. No really, it’s more possible that you’ll live the life you want when you use affirmative language like “I will” instead of “I want to.” Build confidence in your own abilities by choosing powerful language that tells your mind that you can do it. Using phrases like this can also reduce the number of decisions you need to make in a day. Imagine waking up and already knowing how you feel, and what you’re going to place your attention on! I will wake up and feel recharged. I will focus my attention on my body and its signals. Before I go to sleep I will unwind without a screen. I will wake up and feel motivated. I will focus my attention on my own growth potential. Before I go to sleep I will think about something that went right during the day. I will wake up and feel grateful. I will focus my attention on doing purpose-driven work. Before I go to sleep I will practice restorative self-care. Choose the intention first and the goals will follow. If you know how you want to feel, you have a solid framework for living your life according to your intention, and choosing goals that will help get you there. Choosing a wellness ritual for morning, daytime and before bed will help you maintain your intention throughout the entire day. These can be as simple as committing to eating breakfast before you leave the house, turning on your diffuser when you reach your desk, or putting out your clothes the night before. The point is to choose a few things that will help you feel a little bit better each day. Wellness goals are also unique to you and where you’re at. For some, a wellness goal might be to get more restful sleep; for others, it might be to lower their stress levels through meditation, or make healthy meals at home. No matter what it is, find someone who can help hold you accountable to these goals. Better yet, share the STIL journal page with a friend and be each other’s partner in better wellness. At Saje, we love to celebrate and are always on the lookout for a reason to be grateful. We also know that life can come with its share of obstacles and habits are tricky. Whether you lived your intention every day, or only hit your wellness goal for 10 out of 30 days, you still did it: you made a commitment to your own wellness. Take a few minutes at the end of the month to notice what changed for you, and what’s next for you in your goals. Your goals may remain the same, but what matters is the setting of intentions and taking the time to create the best version of yourself.